Broadland Computers - For all your Desktop PC, Laptop and Tablet requirements. Click here. Sandy Hills Family Amusement & Snack Bar - Fun for all the family. Click here. Sea Palling Cycle Hire - Bicycles for all age groups, telephone 07747 483154. We are two small villages on the North Norfolk Coast , a designated Area of Outstanding Natural Beauty, that contain everything needed for a really good holiday or shorter break whether you have family with you or not! Please visit our Gallery and Aerial Views pages to see the Villages and beach. Sea Palling, on account of the nine off-shore reefs built as part of the flood prevention scheme, has a wonderful sandy beach, which has been awarded and retained the coveted Blue Flag award for several years. During this summer, there are Royal National Lifeboat Institute lifeguards on duty from 10 a.m. to 6 p.m. every day from 12th. May until 16th. September Additionally our Inshore Lifeboat Crew all carry pagers so the boat is on call 24 hours a day 365 days a year. As well as good swimming, there is also provision for launching personal water crafts. A toilet block, built only a few years ago, is situated next to the ramp leading to the beach. There is a pub, the Reefs Bar, situated at the foot of the ramp leading to the beach, cafes, amusement arcade, a Post Office and general store, farm shop and a stall which sells fish caught locally. . There is a regular bus service during the week to Norwich for shopping and sight seeing. 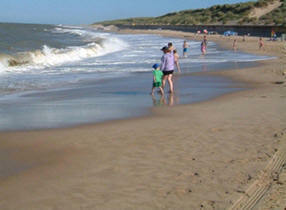 We are equidistant from the seaside resorts of Great Yarmouth and Cromer, which can also be reached by bus. Sea Palling has its own cycle hire. 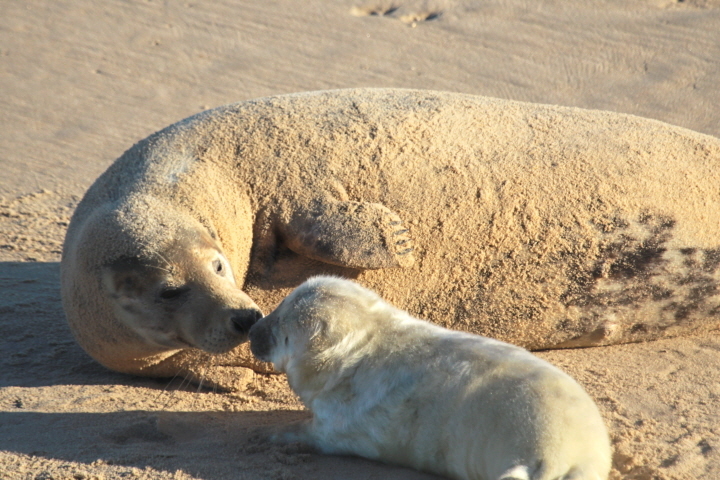 If you are interested in nature then the Norfolk Wildlife Trust reserve at Hickling is only five miles away and both the NWT and RSPB have reserves easily reached by car or bicycle. 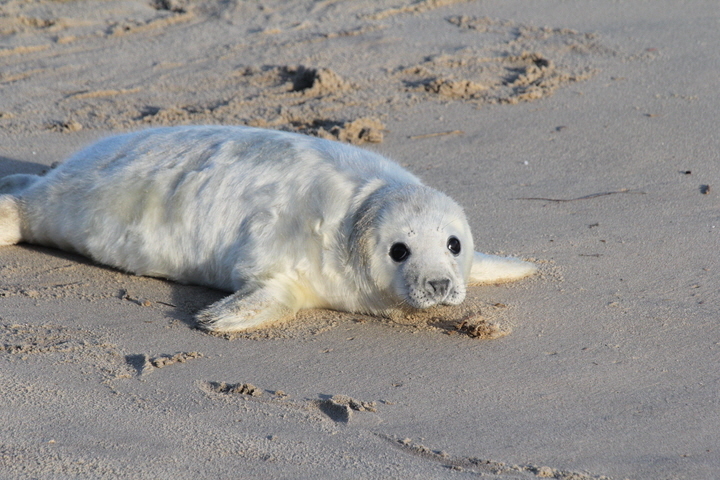 A walk along the beach towards Waxham and Horsey (National Trust) may well be rewarded with sightings of seals. For historians there is the famous Waxham Barn which has been rebuilt following severe damage in the Great Storm of October 1987. Originally built by the Wodehouse family in the late 16th. Century, it is one of the largest in the country. Norwich, some twenty miles away, is famed for having the greatest number of medieval churches in northern Europe, together with the only remaining complete medieval friary in the country. In December 2014 Norfolk's first stretch of England Coastal Path opened from Sea Palling to Hunstanton via the Norfolk Coast Path. The majority of this walking trail runs through the dramatic landscape of the Norfolk Coast Area of Outstanding Natural Beauty. We feel that whatever your interests, you will be able to indulge them during a visit here. Further details may be found on our other pages and we should be most grateful if you would spare the time to look at our advertisers’ inserts listed on the side bar on this page. If you are looking for somewhere to stay then please see our Accommodation Page. Without the generous support of all our advertisers we should be unable to continue running this independent site. We are delighted that, despite tough higher standards, we again retained our Blue Flag in 2018, one of only four awarded in the whole of Norfolk. Additionally, according to the Environment Agency's website (www.environment-agency.gov.uk/bathingwaters) Palling has been awarded the highest possible water cleanliness rating in 2017 (sampled regularly throughout the season) and has maintained constantly high water quality since 2002. 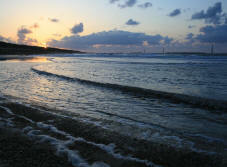 Finally the European Union annually monitors over 22,000 beaches and lakes in all 28 member countries. In its most recently published report (May 2017), the European Environment Agency listed Palling's beach as having continuing excellent water quality in 2016. In 2017 a total of 43,608 pages were viewed by visitors to this site. This website takes no responsibility for the accuracy or otherwise of any advertisements for goods or services (including accommodation) published herein. All transactions are the sole responsibility of the vendor and emptor.